Astronomers using NASA's Kepler space telescope have found a planet 219 light-years away that seems to be a close relative to Venus. This newly discovered world is only slightly larger than Earth, and orbits a low-temperature star called Kepler-1649 that's one-fifth the diameter of our Sun. The discovery will provide insight into the nature of planets around M dwarf stars, by far the most common type in the universe. While such stars are redder and dimmer than the Sun, recent exoplanet discoveries have revealed instances in which Earth-sized worlds circle an M dwarf in orbits that would place them in their star's habitable zone. But such worlds might not inevitably resemble Earth, with its salubrious climate. 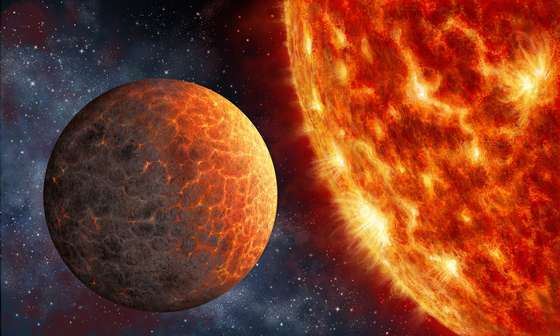 They could just as well be analogs of Venus, with thick atmospheres and scalding temperatures. According to SETI Institute scientist Isabel Angelo, the study of planets similar to the Venus analog Kepler 1649b is "becoming increasingly important in order to understand the habitable zone boundaries of M dwarfs. "There are several factors, like star variability and tidal effects, that make these planets different from Earth-sized planets around Sun-like stars." It's said that Venus is Earth's sister planet, but in many ways it's not a close sibling. Despite being the same size as Earth, and only 40 percent closer to the Sun, its atmosphere and surface temperature are wildly different from our own. If we wish to find life on other Earth-sized worlds, we should take a cue from "The Music Man," and get to know the territory. Elisa Quintana, from the SETI Institute and NASA Goddard Space Flight Center, and a member of the Kepler 1649b discovery team, notes that "Many people are hung up on finding other Earths. But Venus analogs are just as important. "Since new telescopes coming down the pike will allow us to probe atmospheres, focusing on both Earth and Venus analogs may help decipher why, in our Solar System, one planet allows life to thrive, and one does not, despite having similar masses, comparable densities, etc." I'm betting that very few people here understand the full history for how this narrative on Venus emerged. It's worth reminding people. At a time when the scientific community widely assumed that Venus' temperature should be much like Earth's, one man disagreed. He was a Jewish Bible scholar named Immanuel Velikovsky. He correctly predicted that Venus should be very hot. Once it was determined -- remotely -- that he was correct, the scientific community was horrified. They put together a mission -- the Venus Pioneer mission -- and put forth an alternative hypothesis -- the Super Greenhouse Theory. The Venus Pioneer mission was designed to create evidence for the runaway greenhouse effect. The question which few scientifically-minded people take the time to ask is: How did Velikovsky know? Whether or not you agree with his numerous claims perhaps means a bit less than whether or not you understand how he arrived at this hot Venus conclusion. "...In 1939, Velikovsky brought his family to New York City, planning to spend the summer engaged in research at Columbia University's library. He was compiling a psycho-historical text to outline the many intriguing parallels he had uncovered between the Greek literary character Oedipus and the Egyptian Pharaoh Akhnaton. This research, however, was soon sidelined when Velikovsky uncovered an Egyptian papyrus called 'The Admonitions of Ipuwer,' a text that seemed to provide historical confirmation for biblical accounts of the 10 plagues in Egypt at the time of Moses. Intrigued that the biblical account might possibly have foundation in actual historic events, Velikovsky began to seek out other ancient references that might serve to uphold that point of view ..."
"Using the techniques of a comparative mythologist, Velikovsky began a comprehensive review of ancient texts from around the world dating from that same time period, and produced a body of supporting evidence that was more substantial than he at first imagined. ... and similar disasters of seeming mythic proportion. At the same time he also began a search for references that might point to some real-world agent capable of inflicting the kinds of misfortunes described in the Book of Exodus. He eventually settled on the theoretic close approach of a comet to the Earth as the type of natural event that most closely fits the profile of destructive consequences described in the texts." "This tentative conclusion was upheld in his mind by many explicit ancient references to a fearful wandering comet associated with great calamity. References to this comet were given by different cultures under various names such as Seth and Typhon. Velikovsky also found himself confused to learn that in some cultures, the names that had been initially assigned to this fearful comet also came later to be associated with the planet Venus. Meanwhile, Velikovsky became aware of the sudden rise at about that same historical period of what seemed to be a global obsession with tracking the motions of Venus. Many different cultures began to keep careful written counts of the number of days between the risings and settings of Venus. Tracking Venus is the likely motive that is cited by some historians as having inspired the Oracle Bone texts -- the earliest form of written record known to exist in China." "Repeatedly, these calamities were attributed to a malicious deity almost invariably a goddess coming to wreak havoc upon the Earth. Although the actual names naturally varied, the deity involved turned out time and time again to be the one that cultures worldwide associated with the object we know today as the planet Venus. But they didn't talk about it as if it were a planet -- they described it as a comet. A Chinese text describes Venus as spanning the heavens, rivaling the Sun in brightness. Mexican astronomers referred to it as 'the star that smokes,' while on the opposite side of the world the same theme is found in the Hindu Vedas, the Hebrew Talmud, and the Egyptian description of Sekhmet ..."
"The Aztecs called Venus the 'heart' of Quetzlcoatl, which in turn means 'plumed serpent,' with feathers that signify fire. The serpent or dragon is one of the most common figures used in the ancient world to signify 'comet,' examples being the Greek Typhon, Egyptian Set, Babylonian Tiamat, Hindu Vrta, all of whom raged across the sky and brought destruction upon the world. The word 'comet' comes from the Greek coma, meaning hair, and among ancient astronomers referred to a star with hair, or a beard. The same appellation was given to Venus. One of the Mexican names for Venus was 'the mane' -- the Peruvian name, chaska, means 'wavy-haired'; the Arabs call Venus 'the one with hair.' One of the most vivid comet images is the Babylonian goddess Ishtar, recognized universally as representing Venus. Ishtar is described as being 'the bright torch of heaven,' 'clothed in fire,' and the 'fearful dragon,' while her heavenly manifestation is known as the 'bearded star.'" It's of course fine to take the stance that mythology is open to interpretation. What is important to point out is that such a problem has never stopped scientists themselves from formulating models, and even asserting that these models are more true than their counterparts even when glaring problems are present. What I would argue is absolutely crucial is that even when people do not agree with the validity of some comparative mythology claim, they still should be aware of the history for how Velikovsky was able to predict that Venus is hot. It's a very important episode in the history of science. Velikovsky is almost surely the most controversial man to have ever challenged modern science. Advocates of climate change should of course understand how Velikovsky's accurate prediction led to the runaway greenhouse counter-proposal, and that the Venus Pioneer dataset was corrected. It's far more important that people know OF these things than to BELIEVE the claims.